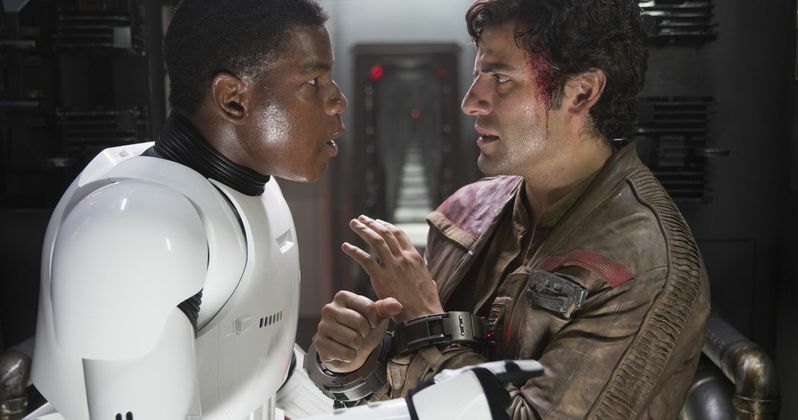 Are Poe & Finn a Gay Couple in Star Wars: The Force Awakens? There are enough theories swarming around Star Wars: The Force Awakens that its tough to keep track of them all. And one of the more popular ones is that Poe Dameron is going to be revealed as the first gay character in the live-action Star Wars movies. There is also a theory that Poe and Finn have a secret gay romance brewing. Oscar Isaac, who plays ace X-Wing Pilot Poe, kept the rumors percolating on a recent Ellen, where he confirmed that there is a very subtle romance going on between Poe and an unidentified character. He says this. "I think it's very subtle romance that's happening. You know, you have to just look very close - you have to watch it a few times to see the little hints. But there was." Some have accused Star Wars of having a 'gay agenda' with Poe. And that has certainly stirred up some controversy, especially with those who feel the franchise needs a non-heterosexual character in the mix. The Shortlist recently conducted an interview with John Boyega, who plays Finn. While the interview hasn't been published yet, the editor had this to say about the young actor's response when asking if Poe and Finn are in a romantic relationship. "Sad news: John Boyega confirmed to me the Finn/Poe romance is not canon and it only exists "in Oscar's head" :("
While Finn seems to hold an attraction for Rey, even asking her if she has a boyfriend at one point in the movie, the notion of Poe being gay hasn't been ruled out. And even if it's true, it may never be mentioned in the movies themselves. Poe wouldn't be the first gay character in the official Star Wars canon. The novel Lords of the Sith introduces an Imperial official named Moff Mors, who is a lesbian. She is confirmed to be the first gay character in any of the comic books, novels, animated series or movies. After John Boyega's comments were made public, ShortList editor Chris Mandle concluded that a non-sexual bromance between Poe and Finn might not be such a bad thing. As a gay romance between characters doesn't need to exist just for the sake of it. Here is John Boyega's full quote on the matter. "Yeah, I've seen that! It's so not true. Oscar wishes it was through, it's all in his head. It's a brotherly love, a bromance, that's for sure." With Moff Mors being introduced as a Lesbian couple, it's true that LucasFilm and Disney are trying to find ways to establish more gay characters into the franchise. But its unclear if that will ever happen in one of the movies. Poe's sexual persuasion may never be addressed in any medium, leaving it open for interpretation. As for now, there is a large group of fans that desperately want it to be true. And there are others who feel it might be blasphemous. Where do you stand?